Strange as it may seem to residents of the western U.S. or coastal areas in the east, one of my favorite sights in Missouri is dry sand! It’s a true rarity in our limestone/dolomite dominated state, a result of nearly continuously exposed land for the past several hundred million years. Only along the state’s bigger rivers, where relatively recent alluvial events have yet to be completely eroded by the passage of time, can significant sand deposits be found. It is in these habitats that one of my favorite of Missouri’s tiger beetles, Cicindela formosa generosa (Eastern Big Sand Tiger Beetle), can be found. In much of the state, tiny slivers of sand dry enough to support populations of these beetles occur sporadically along the Missouri and Mississippi Rivers and their larger tributaries. More extensive deposits, however, are found in several wide, low ridges of sand in the southeastern lowlands of the state—relatively recent alluvial deposits from the last glacial maximum. Sadly, in a region originally blanketed by tupelo/gum/cypress swamp, such relatively dry areas were the first to fall to the plow, and subsequent drainage of the surrounding swamps further promoted a near complete conversion of the entire region to agriculture. She’s got legs up to her neck! Still, tiny remnants of original habitat remain—generally parcels of land that were either too dry and sandy or persistently undrainable. Such parcels now form the basis of Missouri’s system of preserves in southeast Missouri. As tiny as they are and representing only a few percent of their original extent, these parcels now serve a critical role in preserving some of Missouri’s most endangered natural communities. Among these is Sand Prairie Conservation Area in Scott Co., featured several times now on this blog (Sand Prairie Conservation Area, A sand prairie autumn). The sand here is extraordinarily dry, due not only to its depth but also the low organic content—factors that made the land unfarmable and, ultimately, allowed it to escape the conversion that befell the surrounding areas and eventually become a preserve. I have visited Sand Prairie many times in recent years, and although I now know its plants and animals well, there are some that I never tire of seeing—plants like clasping milkweed (Asclepias amplexicaulis), one of my favorite of Missouri’s milkweeds, and animals like C. formosa generosa! Bold white markings and a chunky body make this one of Missouri’s most distinctive tiger beetles. Last weekend I visited Sand Prairie once again, and I was happy to see C. formosa generosa as plentiful as I have ever seen it. I have photographed this species on several occasions, most recently two years ago at a site very near my house. Those last photographs are probably as good as I can ever expect (and in fact one of them even made this year’s ESA calendar), so barring some unusual color form or interesting natural history observation I have little reason to continue taking photographs of it. Nevertheless, I’m trying out a new diffuser, which was all the excuse I needed to try my hand again with this big, beautiful species. 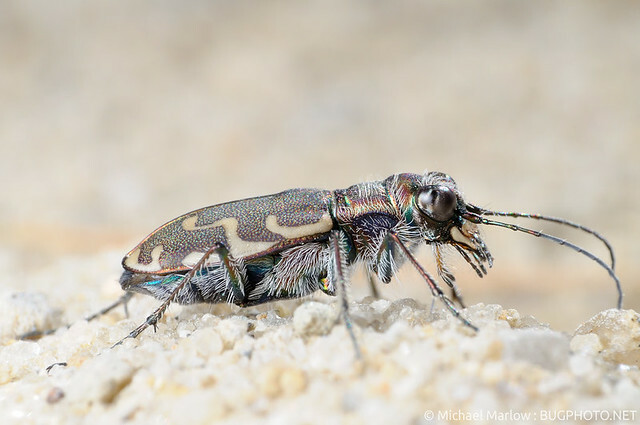 I was once again reminded of why of I love this tiger beetle so much—their bulk, their bulging eyes, their long, looping escape flights that end with a comical bounce and tumble, only to end up on their feet and facing their pursuer. These beetles are loaded with personality and behavioral charisma. It was an unseasonably warm and humid day, so my opportunities to photograph them were limited. I hope these few that I present here impart some of that personality. Missouri individuals often show a hint of the red coloration that characterizes populations further west. Great shots, Ted; I especially like the first one. I don’t come across a lot of tiger beetles in my neck of Massachusetts (probably due to a lack of knowledge of where and when to find them), but I have found what appears to be a recurring, small stomping ground for some very cool tigers in the state park just down the road. They make me appreciate your shots that much more, because they are so hard to shoot! I’ve lately become more interested in shots that are panned back a little bit (such as the first one) for more creative composition. I like the void underneath the beetle created by the stilting behavior (to lift itself up above the thin layer of super hot air just above the sand), and the space around and to the left of the beetle emphasizes the void. Nice shot yourself. Yes, that is Cicindela repanda, and I’m pleased to see you’ve taken the shot from such a low angle. Thanks for checking it out! I am trying to stay more panned back myself, though I have a habit of zooming in closer and closer. I’ve got a mating pair sort of “on their toes” so to speak, but I’m hoping to get an individual at some point. It really is a striking pose. I look every time you post, but have never thanked you. Thank you for these photos. I really needed beauty and life today. I always enjoy your superb photos (you put artists like me out of a job!). Especially photos of Tiger beetles! Although I’m not a photographer, I really enjoy reading all your experiments with different techniques — you don’t keep them secret like many would. This one is great — those pale hairs make it really unusual. You’re so lucky in the US to have so many wonderful insects — here in the UK there’s very few. **Have you photographed Cicindela chinensis (‘Harlequin beetle’)? Quite large and incredibly colourful — the subspecies japonica is especially colourful. You’d do it proud. You have some amazing photos of beetles. I don’t know many of them by name, but they make really nice photos. I would look for Cicindela oregona in beachside habitats or other riparian habitats.